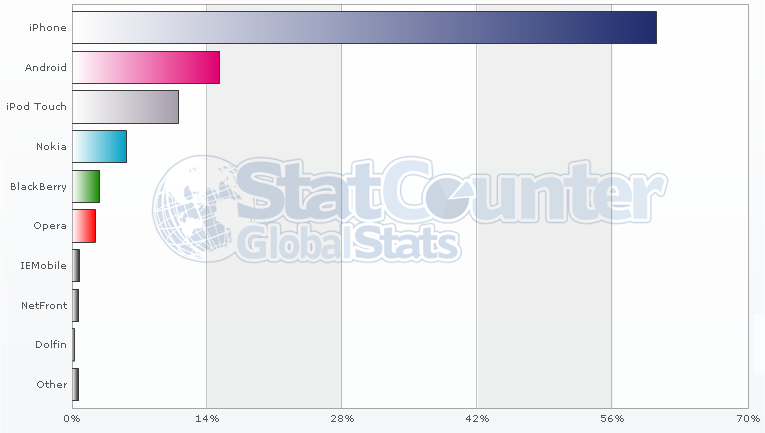 I was having a look today at the mobile browser market shares in Australia over the past month (June-July 2011). This is basically showing the popularity of the mobile phones most used for mobile internet surfing. We wrote about Mobile Browser Market shares for Australia in May if you want to check previous figures. The figures do remain relatively steady, iPhone/ iPod has a huge percentage of the market, Android gaining, BlackBerry struggling. I suspect BlackBerry can slowly crawl it’s way back with their new smartphones and also the Windows7 phone will gain more traction as people adopt the Microsoft mobile. It will be interesting to keep track of this and we will update you monthly with the new figures.